I tried really hard to think of sexier name for this. 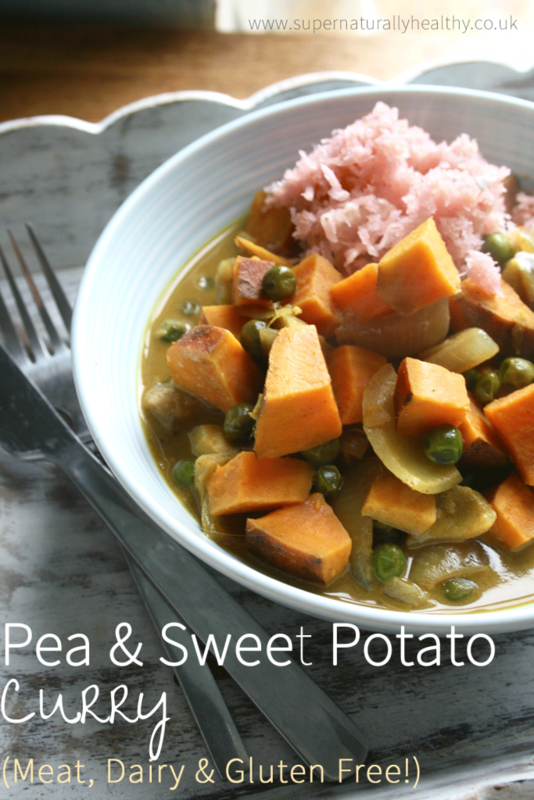 Pea & Sweet Potato Curry sounds very British and plain doesn’t it? But trust me this is super delicious. Curries are a weekly staple in our house. A lot of my clients who are transitioning to eating gluten free find what to eat for lunch the hardest but Joe and I (Joe being the man of dreams/husband but has recently gone sans gluten) just make a massive batch of veggie curry at the start of the week and have it with sauerkraut for lunch or topped with avocado. Tasty speedy stuff. This is the perfect blend of healthy carbs from the potato, protein from peas, fats from coconut and all the healing goodness from the turmeric and cayenne (find out why I have turmeric every day here). 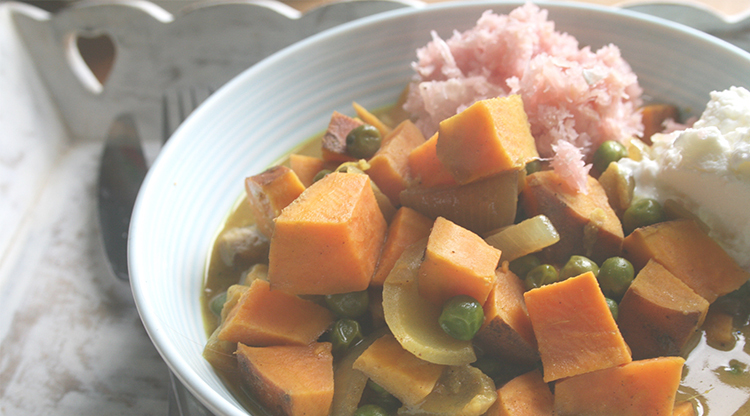 A simple and tasty curry to adorn your dinenr table! In a pan on medium heat add 1 tbsp of ghee or coconut oil and add chopped onions and saute for a few minutes until the edges become clear. Add the salt and all the spices to the pan. Chop the sweet potato into small diced pieces (peel if you want but I don't) and mix in. Add the coconut milk and frozen peas and bring to boil. Simmer for about 15 minutes or until sweet potato is soft. Season with salt as necessary. Serve with rice or whatver else you fancy. Use quality veggie stock to make it vegetarian. Feel free to use and add other veg - like some added frozen spinach woudl also taste yum in this! And if you want something sweet to follow that is not filled with crap but will actually do you good then make sure you check out my Sweet Treat Collection Recipe eBook here. Whats your favourite curry combo?